The past few months have been busy busy, and while there have been many days I've needed to write out/sort out some roller coaster emotions, I haven't had anything particularly profound to share. Today I don't plan on offering wisdom or advice, but had an excellent day with my kid and wanted an excuse to show off some beautiful photos. We've really continued to struggle with our fertility situation (which is to say there is none) and we are still in a limbo place, not quite ready to pursue any of the few options that are left. If we were to be asked about our relationship status with Fertility in general, no doubt we'd choose 'it's complicated'. It's been a challenge to watch our neighbors and friends (not to mention acquaintances and strangers) continue to move forward in their own family building and feel left behind. 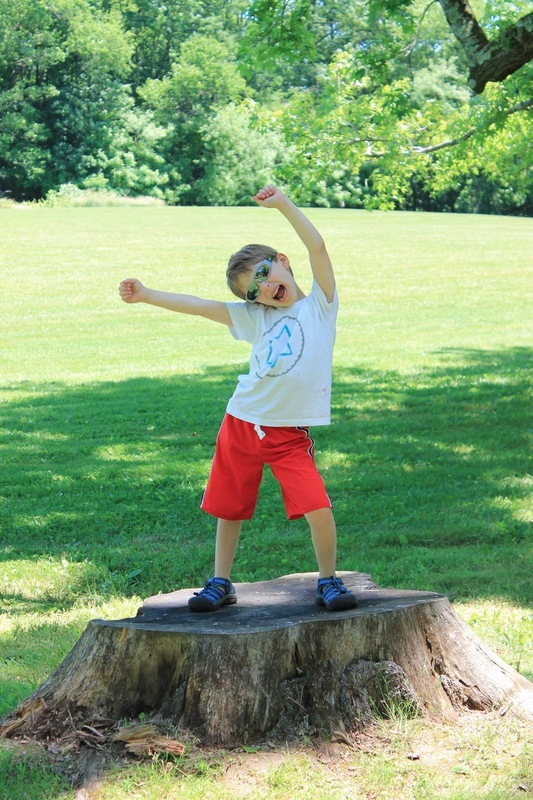 At the crossroads of the third anniversary of my diagnosis of cancer, and the end of Judah's kindergarten year, we are faced with decisions that need to be made at some point if we do want to grow our family. I'm torn. Struggling to decipher between listening to my intuitive voice(s) and pushing away fears. Are they simply fears of the unknown? Or is it my intuition screaming at me to not make a giant mistake? I guess at some point, I'll read an article or hear a story or come to some sort of realization that will push me one way or another. I'm sure there are many of you wondering what in the world I'm really talking about, but I don't feel quite as comfortable publicly sharing all of the intimate details of our IF journey. Perhaps it is the stigma, the shame, guilt, yadda yadda, that go along with our circumstance (though, of course rationally, I can agree that it has nothing to do with me as a person whatsoever). I'm not quite certain what makes this wound so tender that I must keep it covered and private. It's quite the opposite of how I felt about sharing my story 3 years ago. And then we've got this amazing kid. I woke up this morning and saw that the sun was seeping through the blinds, trying to touch every corner of the house, and I realized that today was the day for playing hooky with the kid. Zero humidity, zero clouds - your basic California sunshiny day. In Philadelphia, we don't get too many completely perfect days in a year. 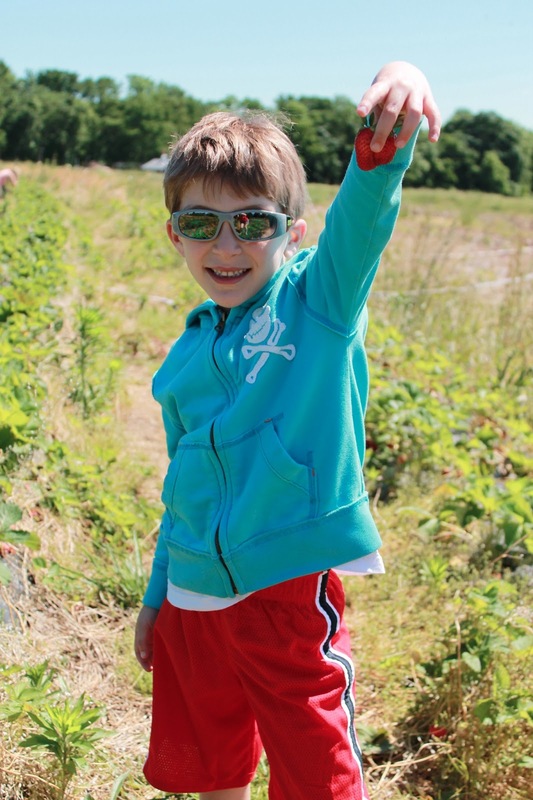 And life is just too damn short to not pull your son out of school to go strawberry picking on such a perfect day as today. Too damn short. Let me say, there are plenty of times he doesn't listen, he plays instead of aiming properly, dawdles, cries for no reason, makes enormous messes, leaves his toys EVERYWHERE, stains his clothes/upholstery, sings in my ear, jabs me with his pointy elbows, accidentally breaks lovely household goods... But not today. All cooperation, smiles, listening to directions, all the goods. He was thrilled when I presented the idea to him, and gladly joined me on a road trip to the countryside strawberry farm. We chatted as we picked, compared strawberries - shades of red, sizes, shapes - and accumulated quite a pile in our box. Upon leaving the field, I caught a whiff of some fragrant honeysuckle, and promptly taught him how to gently nibble the bottom of the flower to taste the tiny droplets of sweetness inside. He was hooked. We moved on to lunch. Picked out whatever friggin sandwiches we wanted from side-by-side bbq and gourmet lunch spots and brought them over to the Fonthill Museum grounds (which happen to be where Dan and I were married). Laid our food out on the grass and stuffed our faces (and ate even more strawberries), sampled more honeysuckle, and walked in the woods a bit. I showed him the inside of the Fonthill castle (that is now a museum) and the tile factory across the property. He was impressed, but probably just because he wanted to buy something. After all, what fun is it if you go home without a souvenir? On our way home, we stopped off at a market where I grabbed a few locally grown eggplants (for tomorrow night's dinner) and surprised him with a scoop of vanilla fudge brownie ice cream. Total indulgence. The day was blissful. We took turns picking songs from my iPod on the way home and then he sang all of the songs he's been learning for his end of kindergarten performance (sniff, sniff). I sang with the windows down and Indigo Girls blasting (for every other song, at least). Best decision I've made in a very long time.